Before you can sign up, you have to be connected to the web, so now’s the time to fire up your computer. After you open your Internet browser, you’re ready to sign up. In the address box of your browser, navigate to eBay. Your next stop is the eBay home page. Right there, where you can’t miss it, is the Hi! Sign In or Register set of links. Click the word register and let the sign-up process begin. Enter the basic required info. You register on eBay through an encrypted (supersecret) connection called SSL (Secure Sockets Layer). You can tell because the normal http at the beginning of the web address is now https. The SSL certificate verification (in a lower corner of the Get Started on eBay page) means that eBay has moved you to a secure place on their site that is safe from unauthorized people seeing or receiving your information. Your information is treated with the highest security, and you can fill out these forms with the utmost level of confidence. The more precautions eBay (and you) take, the harder it is for some hyper-caffeinated high-school kid to get into your data. After you click the Register link, you go to the first registration page. At the top of the page, you will see that you are creating a personal account. If you’d prefer to start a business account, click the appropriate link. Why not start with a personal account — just to get your feet wet. eBay asks you to fill in some required information. 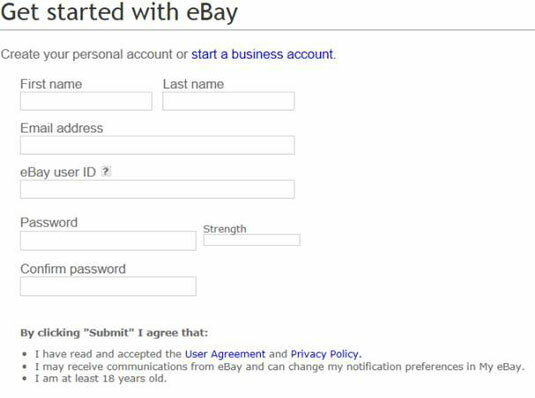 You can change your personal eBay account into a business account when and if you decide it’s time. After you input your personal information, you’re ready to create your eBay persona. 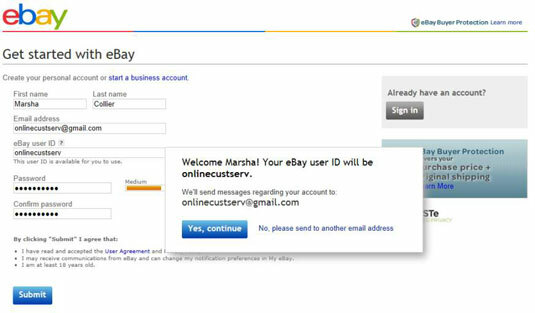 Type in your new eBay user ID. Your user ID is the name that will be shown to other users when you bid, buy, or sell. But don’t strain your brain too much right now over your choice of user ID. You can change your user ID once every 30 days. 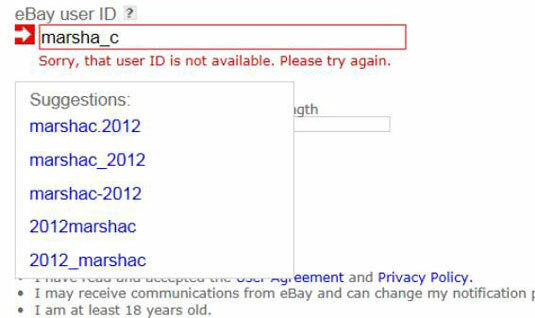 If your chosen ID is already taken, eBay has a handy tool to help you select another one. Choose a password, enter it in the Password box, and then type it a second time in the Confirm Password box to confirm it. The best passwords for eBay or any website are more than six characters long and include a combination of letters (upper- and lowercase) and numbers. Never use your user ID, name, pet’s name, address, birthdate, or anything that may be easily known by others. C’mon, get a little cagey. Read the not-so-fine print and click the Submit button. At this point, eBay tells you that they will send an e-mail to your e-mail address for confirmation. If that’s OK, click the Yes, Continue button. If you’d prefer the e-mail be sent to a different e-mail address, click the No, Please Send to Another Email Address link. eBay will prompt you to type the alternate e-mail address in the original Email Address text box. It’s safe to use your personal e-mail address for eBay registration. You will not be put on any spurious e-mail lists. If you change your user ID, an icon of a little blue character changing into a gold one appears next to your user ID. This icon stays next to your user ID for 30 days. Double-check when you see others with this icon. Some users may try this to mask a bad reputation. They can’t hide it completely, though. You can find the dirt by reading feedback profiles.